Hotels that are away from the hustle and bustle of city center. 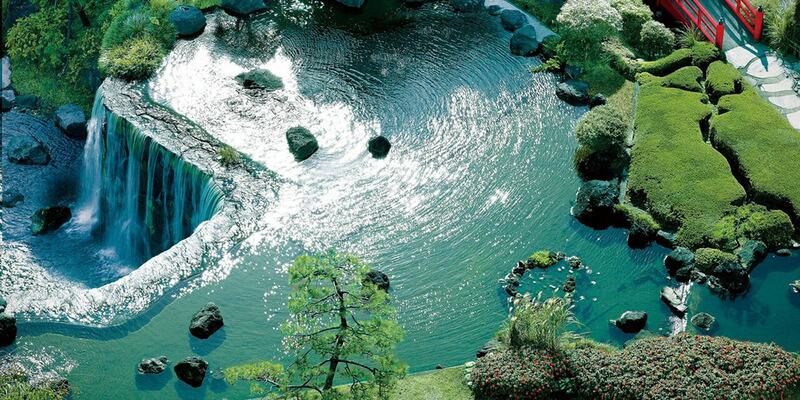 Some Western style hotels in Japan have lush Japanese style gardens on their premises. It is pleasant space that quietly welcomes the guests, dotted with well looked after flowers and plants, historical properties such as stone lanterns and tea room. It is especially enjoyable to walk in the morning, listening to the sound of the water in the pond or the waterfall in the garden. 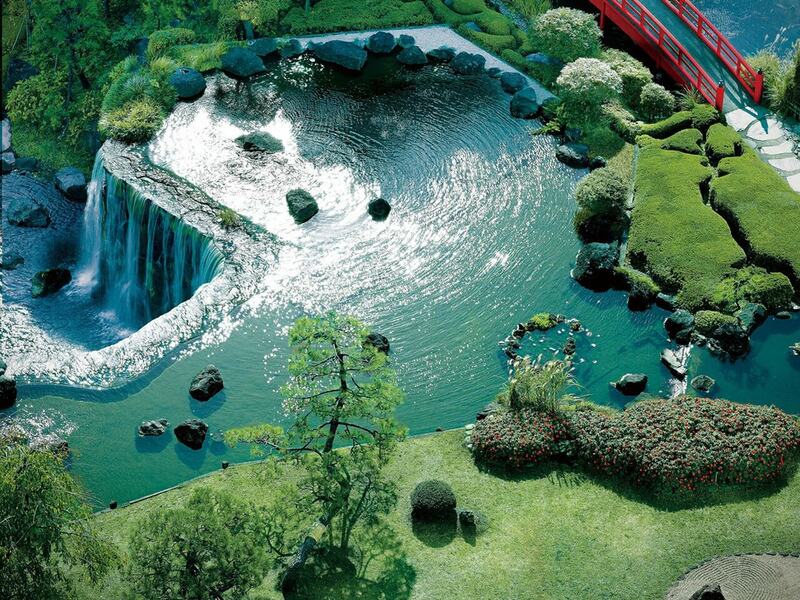 For the stay with limited time to spend, choosing a hotel with a wonderful Japanese style garden can be a good idea. 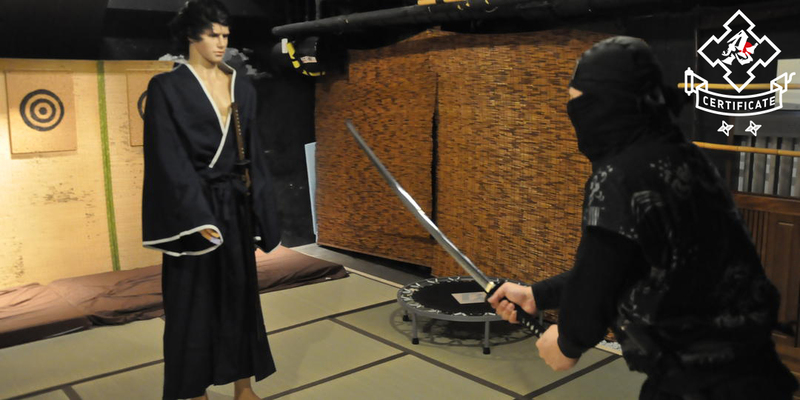 In Japan, it is a status symbol to hold your wedding ceremony at a hotel with a Japanese garden, and one of the most popular choices is Hotel Chinzanso Tokyo. 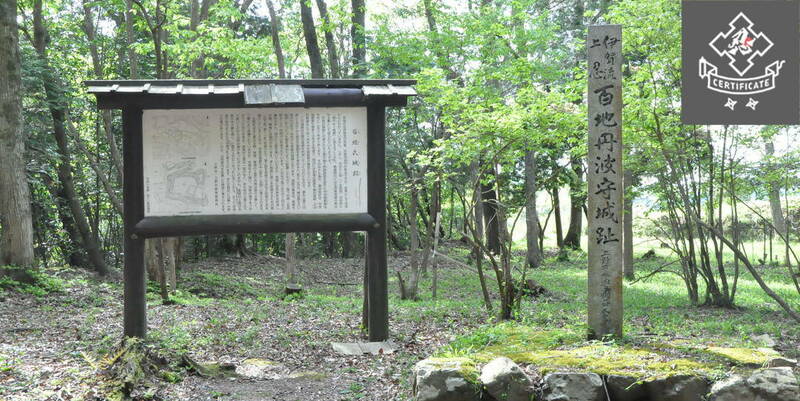 Mejiro-dai was a scenic spot where wild camellia grew in the Nanboku-cho period (14th century). It is named "Chinzanso" by politician Aritomo Yamagata from Meiji era. 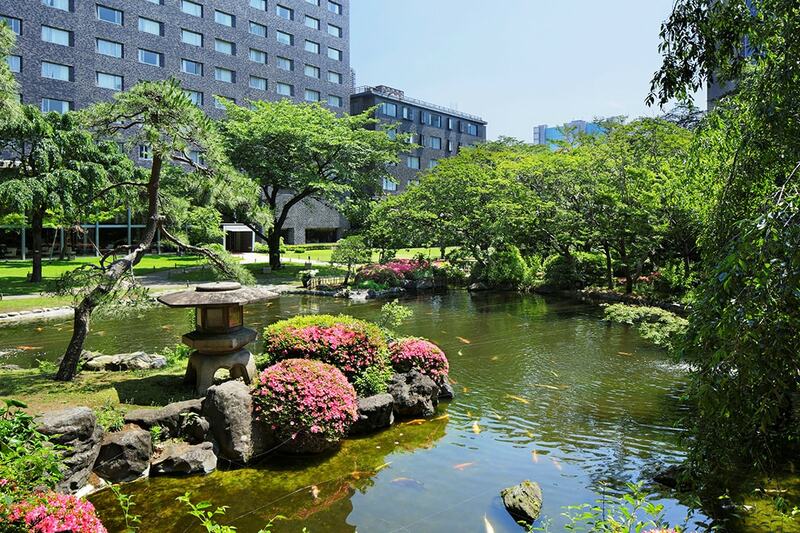 The garden was originally built by Yamagata and inherited by the hotel. It is a forest like garden with water flowing from a spring, and fireflies flying away. 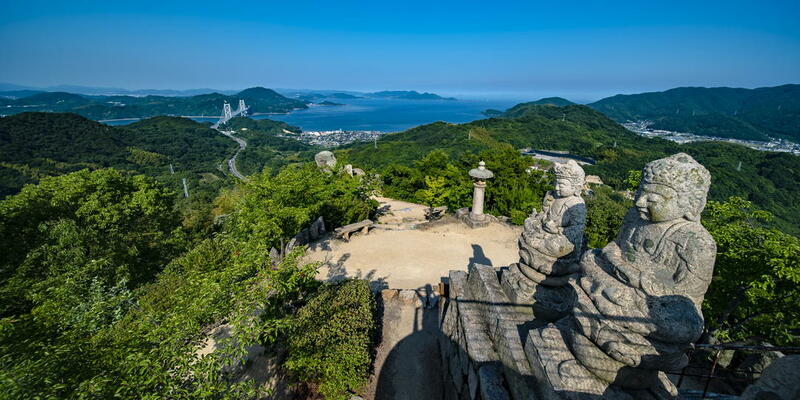 There are many historical sites including the three-story tower "Entsu-kaku", which is a Tangible Cultural Property, the tea room "Zangetsu-tei", there are also stone lanterns and many other historical properties that welcome the guests throughout the four seasons. 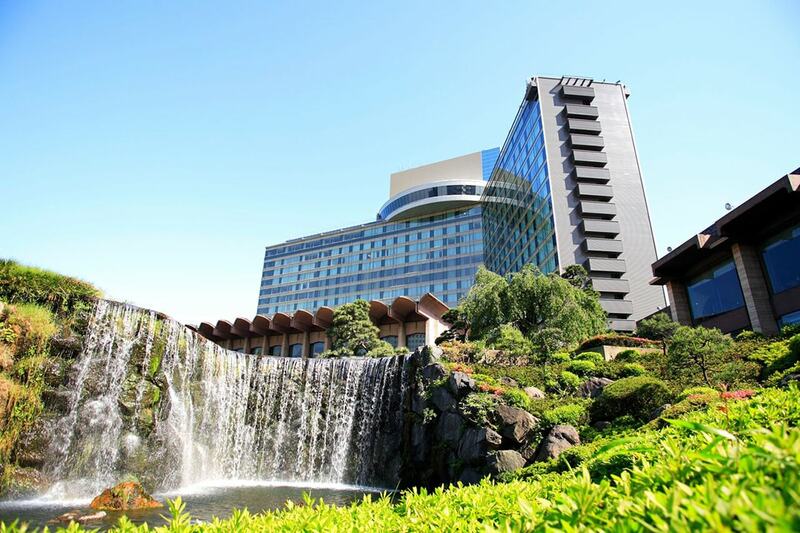 It is one of the most prestigious hotels in Japan, and has a Japanese style garden boasting a size of 40,000 square meters, despite being in Kioi-cho, which has become a major political and economic hub since Edo era (from the 17th century). Surrounded by moats and trees, big waterfall of 6 m in height and a vermillion hump bridge create a splendid beauty. 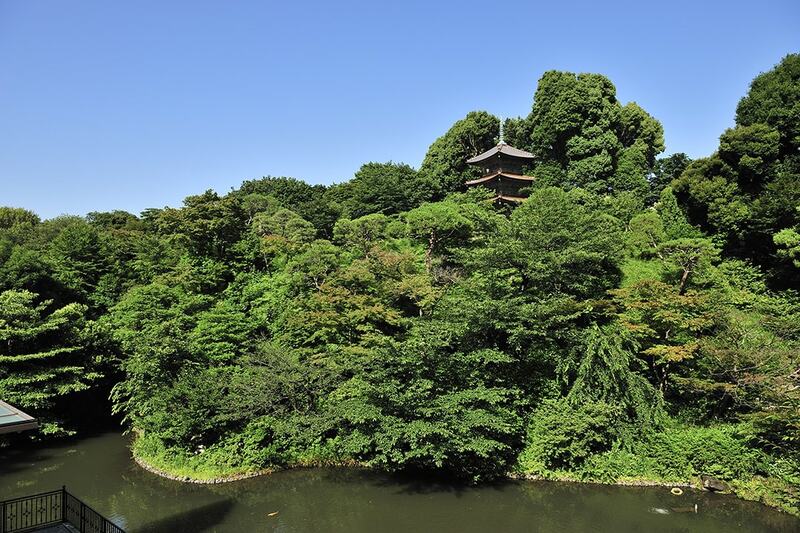 Once housed a mansion resided by the historical figures such as Kiyomasa Kato and Naosuke Ii, it became a beautiful garden with big pine and camphor trees when handed over to the royal family. After the Second World War, the founder of the hotel took over the command and remodeled the once-desolated garden. 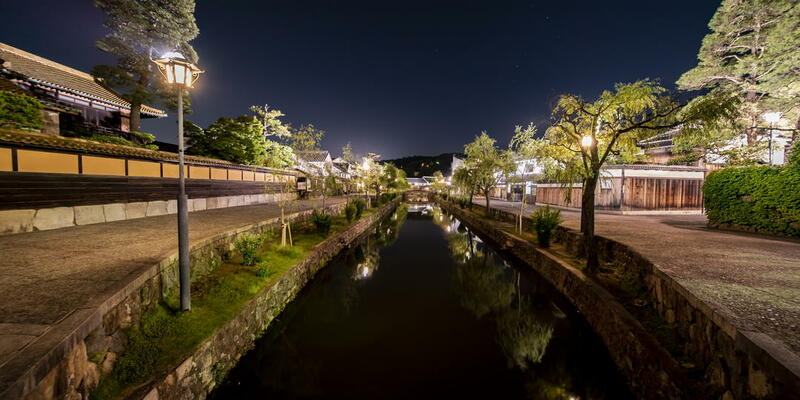 After that, basing on a stroll garden, we arranged ponds, bridges, Kare-sansui, tea room, and 42 stone lanterns etc., and gradually change the style to convey the atmosphere of Edo era today. 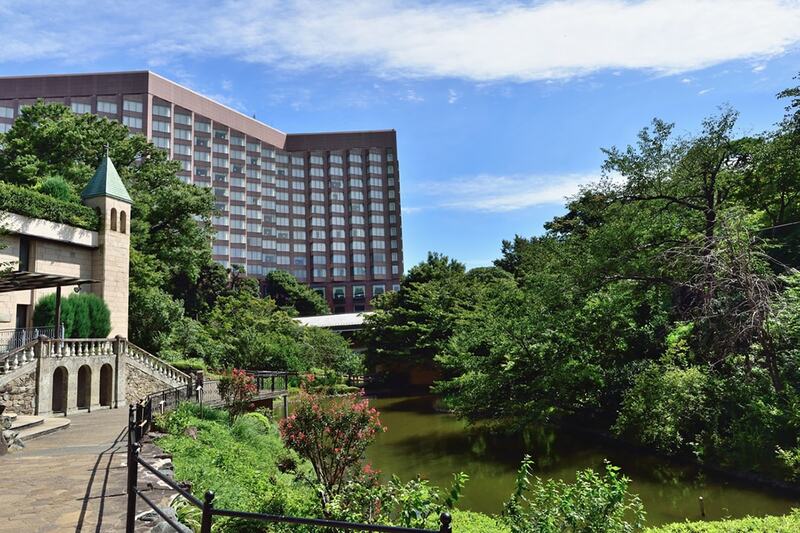 The three Prince hotels in the Takanawa area (The Prince Sakura Tower Tokyo, Grand Prince Hotel Takanawa, Grand Prince Hotel New Takanawa) are built surrounding the Japanese style garden of approximately 20,000 square meters, you can walk there from any of the three hotels. 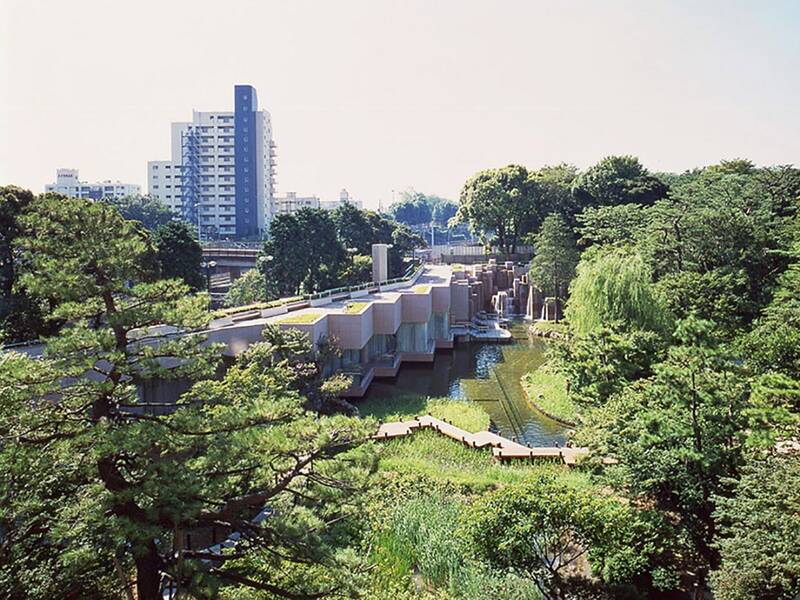 Mr. Teiji Kusuoka, who also worked on the Imperial Palace, designed the garden. 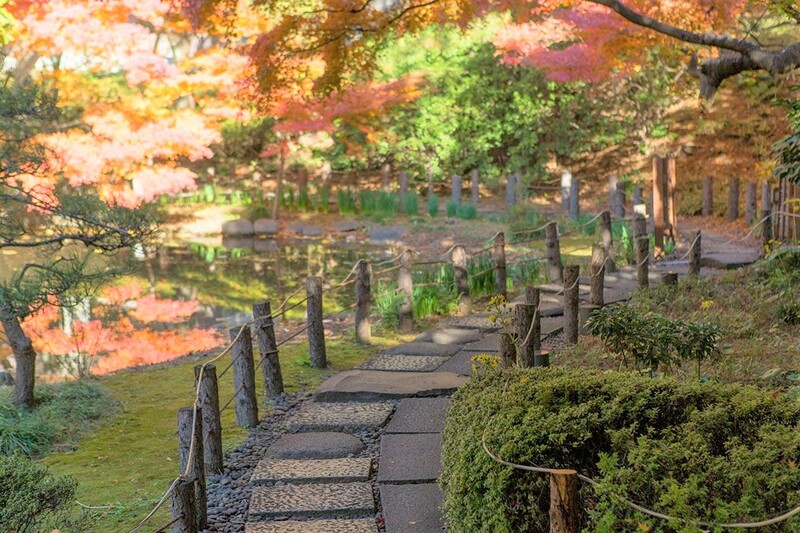 Flowers and trees such as more than 200 cherry trees, plum, daffodil, Hagi and Sazanka, along with the pond create a beautiful Japanese landscape throughout the four seasons. Before the Second World War, Takanawa is the premises of the royal family, and a mansion (“Takanawa Kihinkan” today) is still present in the garden and the historical sites such as the tea cottage, Kannondo, bell tower and the mountain gate are scattered there. When staying at the inn "Takanawa Hana-koro" within the hotel which opened in 2017, you can enjoy much Japanese charms. 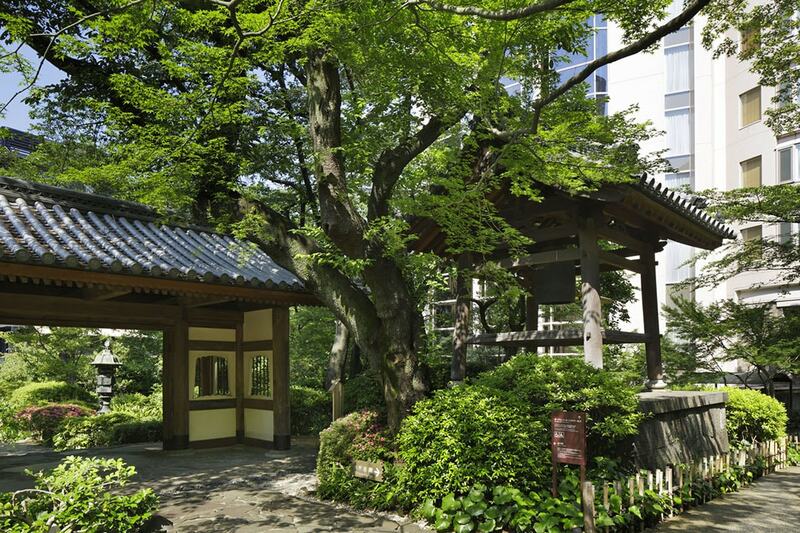 Shiroganedai, which is considered as one of the most luxurious residential areas in Tokyo, is a quiet town. The greenery in the Japanese style garden overlooked from the calm and relaxing lobby lounge "Bamboo" is exquisite. The hotel used to be a mansion for a businessman, Mr. Fujiyama. When walking from the basement to the Japanese style garden, you will notice a stone tower and bodhisattva statue full of exoticism, which is slightly different from the purely Japanese appearance, which conveys the heyday of the Fujiyama family, who went to Taiwan and other countries abroad. Panoramic views of big ginkgo and Kaede trees on the slope of 6,000 square meters and Japanese-modern style interior design of the guestrooms in dark brown tones quietly relaxes the guests. The Gotenyama garden spreading in front of the world-class brand, Tokyo Marriott Hotel, is a Japanese style garden that retains the remnants of the olden days of Gotenyama, known as a great spot for enjoying cherry blossoms in Edo era (from the 17th century). In Edo era, Gotenyama in Shinagawa, where there was a shrine honoring falconry made by the family of Tokugawa, who was the general. Later, it became known as a cherry blossom viewing point, also it appears in "Tokaido Shinagawa Gotenyama no Fuji" drawn by Katsushika Hokusai's. The sound of the waterfall and pond water, and the seasonal trees create a refreshing space where you can forget about the hustle and bustle of city center. 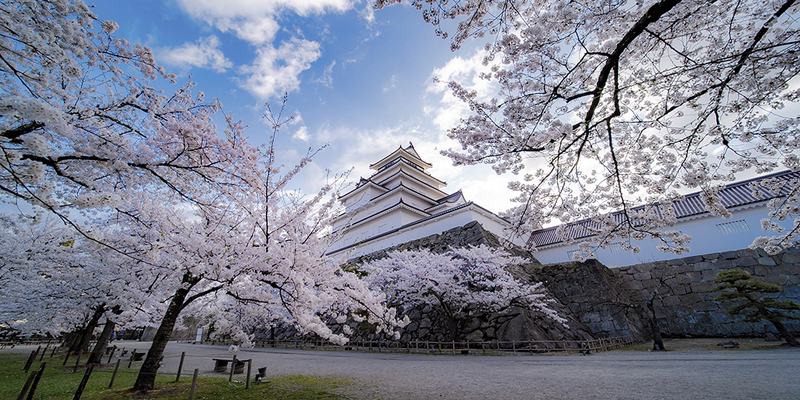 You can enjoy plums and cherry blossoms in spring, hydrangea in early summer, colored leaves and ginkgo's leaves in autumn, Kan-Tsubaki in winter. The easily accessible location is also attractive, 10 minutes on foot from "Shinagawa Station" which is set to be a getting-off station of Shinkansen.